Stacks of Wax have supplied candles for hundreds of functions ranging from intimate dinners for a few people to large parties for over 3000 guests. We can offer advice and assistance on all aspects of using candles at functions including colouring and styling, placement, light intensity and effects, delivery and pick-up. 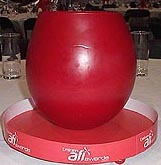 As well as standard candles we can supply floating candles, super large candles, lantern candles and holders. We also offer a wax and candle recycling service. We reuse left over wax to make new candles and also store and make available used candles to charities and other community organisations which are having fundraising events at no cost. Hand poured beeswax candles in tumblers complimented the Australian bush flower table centrepieces at this spectacular event. Stacks of Wax supplied lanterns for the decoration of VIP areas at the festival as well as producing a marquee with a selection of our candles in the "Very Small Mall". Held at Incubator Studio Surry Hills, the launch party and fashion showing presented many new and established labels as part of Australian Fashion Week. 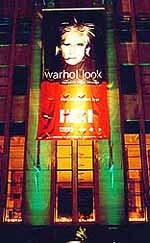 Held at Cargo Hall, Circular Quay, Stacks of Wax tealights and frosted holders stylishly complimented this Australian Fashion Week event. bowl candles bathed the room in golden light. Stacks of Wax supplied and installed red lantern candles for the Australian film industry awards after party held at Fox Studios in Sydney. The lanterns were the centre pieces for the tables where VIP guests dined. White pillar candles we provided at no cost to the Andrew Olle Memorial Trust for their annual dinner held at Parliament House in Sydney. 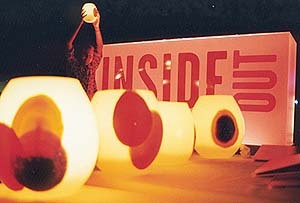 Stacks of Wax supplied over 200 lantern candles with dots for this event held at Finger Wharf Sydney. 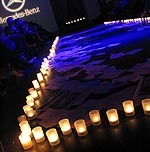 As an invitation, 1200 lanterns were sent to clients and guests of the magazine in presentation boxes. 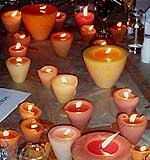 Stacks of Wax supplied over 300 hand moulded block candles for this event. As can be seen in the photo, the light from the candles placed on the tables and in the window bays gives the room a sensual glow. No additional lighting was required for the reception.